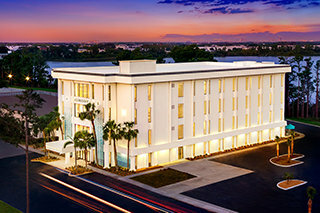 The new Church of Scientology Orlando stands in the center of Florida’s largest inland city. Just minutes from the city’s theme park avenue, International Drive, the expansive facility on nearly four acres is fully equipped to provide a center to expand the Church’s humanitarian outreach across Florida’s magic capital. RECEPTION Open seven days a week, morning to night, the Church of Scientology Orlando Reception welcomes anyone wishing to obtain an introduction to Dianetics and Scientology. SCIENTOLOGY PUBLIC INFORMATION CENTER The Public Information Center offers over 500 films, providing a complete introduction to every aspect of Dianetics and Scientology. It includes the beliefs and practices of the religion, a biographical presentation on the life and legacy of Founder L. Ron Hubbard, as well as the many humanitarian initiatives and community outreach programs the Church supports. INTRODUCTORY SERVICES The Church of Scientology Orlando provides for the delivery of all Introductory Services. These include an entire array of Scientology Life Improvement Courses designed to help improve any aspect of one’s life. Among the many services available are evening and weekend Dianetics and Scientology seminars imparting an overview of the fundamental principles and their application for living. DIANETICS & SCIENTOLOGY BOOKSTORE The Church of Scientology Orlando Bookstore makes available L. Ron Hubbard’s works on Dianetics and Scientology. In all, Mr. Hubbard’s legacy comprises tens of millions of published words in dozens of books and thousands of recorded lectures. A Materials Guide Chart provides an informational overview of every book and lecture series and the subjects contained within each. Materials are available in 50 languages. THE PURIFICATION CENTER Scientology Founder L. Ron Hubbard developed the Purification Program to free individuals from the mental and spiritual damage caused by drugs and toxins, through a regimen of exercise, sauna and nutrition—all of which are provided for in the Purification Center. The mural depicts the hallmarks that define Orlando as an international center for entertainment and innovation. HUBBARD GUIDANCE CENTER The Hubbard Guidance Center is where Scientologists receive one-on-one spiritual counseling, known as auditing. Just beyond the waiting room are dozens of auditing rooms. Each one of the auditing rooms is ideally appointed to provide the calm, distraction-free setting requisite to achieving spiritual enlightenment. THE ACADEMY The Academy is where Scientologists train to become auditors (spiritual counselors), capable of applying the technology of auditing to help others attain spiritual freedom. The Orlando Academy comprises multiple course rooms, each devoted to a different aspect of training. THE LAKES CAFÉ The Café welcomes visitors touring the Church and provides a gathering place for those attending the many scheduled events. It further provides for parishioners during breaks in their Scientology services. THE CHAPEL The Chapel, lined with the Codes and Creed of the Church of Scientology, provides for all congregational ceremonies and services—including Sunday Services, Weddings and Naming Ceremonies. The Chapel also serves as an ideal venue for workshops, banquets and events, in the name of community collaboration for the betterment of Orlando. 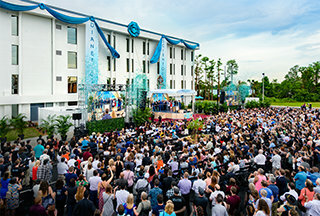 THE OFFICE OF L. RON HUBBARD As is tradition in all Churches of Scientology, the Office of L. Ron Hubbard stands in honor of the religion’s Founder and symbolizes that this Church is true to his writings and ideals. It is with great pride we welcome you to our Church. Since 1982, we have served a growing congregation in Orlando. Today, from our new home adjacent to Lake Ellenor, we are honored to extend our help to communities across Orlando. Our Church realizes Scientology Founder L. Ron Hubbard’s vision that all Churches of Scientology become what he termed Ideal Organizations (Orgs). Ideal Orgs not only provide the ideal facilities to service Scientologists on their ascent to higher states of spiritual freedom, but they also serve as a home for the entire community and a meeting ground of cooperative effort to uplift people of all denominations. To that end, we share our Church and our many social betterment and humanitarian programs with greater Orlando. We look forward to working with every group and individual dedicated to uplifting society in the same spirit in which this “City Beautiful” rose to become a dynamic international destination. Together, we can achieve our common dream of a civilization without insanity, without criminals and without war, where the able can prosper and honest beings can have rights, and where Man is free to rise to greater heights. A “Magic Kingdom” of a metropolitan region where enchantment is routine, the surreal is real and stars are wished upon, the “Theme Park Capital of the World” is entirely unique. Home to wonderlands such as Walt Disney World, SeaWorld Orlando, Universal Studios and the Wizarding World of Harry Potter among many more, Orlando’s massive playground draws fun-loving, thrill-seeking tourists of all ages from across the globe. While just minutes from Orlando’s theme park avenue, International Drive, you’ll see the newest “shining star,” already twinkling in the Church’s growing interstellar galaxy. The expansive facility sits on nearly four acres in the center of Florida’s largest inland city, along the shores of Lake Ellenor. In this charmed place, where laughter and imagination are timeless, a crowd of over 2,000 Scientologists and friends converged under the Central Florida midday sun on Saturday, May 12th, to celebrate the grand opening of a new Church of Scientology.